The game's gory fatalities remain a sticking point for the Australian ratings board. The OFLC, the Australian equivalent to the ESRB, has upheld its decision to refuse classification to the new Mortal Kombat, in the face of an appeal by publisher Warner Bros. Interactive Entertainment. This effectively bans the game for sale in Australian, unless WBIE change the game so that it is more palatable to the OFLC's sensibilities. The sticking point seems to be the game's sixty fatalities. The OFLC acknowledged that the finishing moves were obviously exaggerated in nature, and that the game was fantastical in tone, but said that the high quality of the game's graphics pushed the game beyond what is appropriate for a minor to see. As Australia lacks an adult rating for videogames, this meant that the game was refused classification. WBIE resubmitted the game, however, saying that the game was no worse than other titles that had already been passed for sale. This effort ultimately proved unsuccessful, but WBIE thanked the thousands of Mortal Kombat fans, both in Australia and internationally, who had voiced their support for the publisher's efforts. The most likely course of action now would seem to be that WBIE tones down the level of violence in the game, and resubmits it a second time. It's not an ideal solution by any means, but it's hard to see what other options WBIE really has. Hopefully, it won't take too much to get the game the thumbs up for an MA15+ rating, allowing Australian gamers to have an experience close to what developer NetherRealm, wanted, without having to go to the trouble of importing the game from another country. 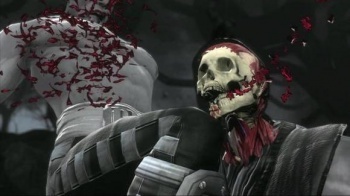 Mortal Kombat comes out for Xbox 360 and PS3 on April 19th.